In the heart of the Loire chateaux country, just 5 minutes from Amboise, the Chateau de Pintray, a 16th century feudal domain, is now a winegrowing estate with Montlouis-sur-Loire and Touraine appellations. 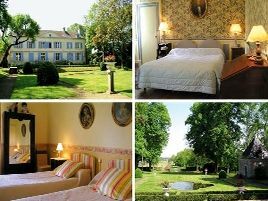 The splendid house with its rich historical past sits within large, leafy grounds surrounded by vineyards. Very comfortable, elegantly decorated rooms, with lovely antique furniture. Wine-tasting of the property's wines. Truly friendly welcome. A great address!. - Dégustation des vins AOC Montlouis-sur-Loire et AOC Touraine rouge. 2 suites and 3 rooms with bath or shower and WC. 100 euros (1 pers. ), 110 euros (2 pers. ), 135 euros (3 pers. ), 160 euros (4 pers.). Extra bed 25 euros. Baby equipment, babysitting, games, children's meals. For teenagers: pool table, table tennis, comic books. Family suites with communicating rooms. Peaceful environment. The closest station is Saint-Pierre-des-Corps, located at 18 km. The closest airport is Tours, to 20 km.